On the Finish page you can specify what happens when the deployment of your package is complete. You can also specify if an application should be run before your package is uninstalled. Show a message box: The installer's window will remain visible when the installation has completed. It will show a message and a "Thanks" button that you can customize on the Language page. Prompt for system reboot: The installer's window will remain visible when the installation has completed. It will show a message informing the user that the system should be rebooted to finish off the installation. It will offer the user the choice between automatically rebooting or just closing down the setup program, requiring the user to reboot manually later on. Note that even when this option is not selected, DeployMaster will always prompt to reboot when one of the files it had to install could not be copied to its final destination because another copy was already there and in use by the system (and thus DeployMaster could not get write access). DeployMaster will make sure that the file is properly installed upon system reboot. This means that you should only select this option if your FinishDeployment() routine or any of the 3rd party setups perform an action that requires the system to be rebooted (which DeployMaster cannot detect). Show Start Menu folder: Open the folder under Start Menu|Programs where the icons for your application have been placed. The user will then be able to launch one of the shortcuts right away. This option is useful if your package consists of several modules and the user may want to start using any one of them. Automatically launch file: Automatically execute a certain file, usually the application's main executable. This file must also have been added to the Files page. You should type in the full path and filename of the file on your system. 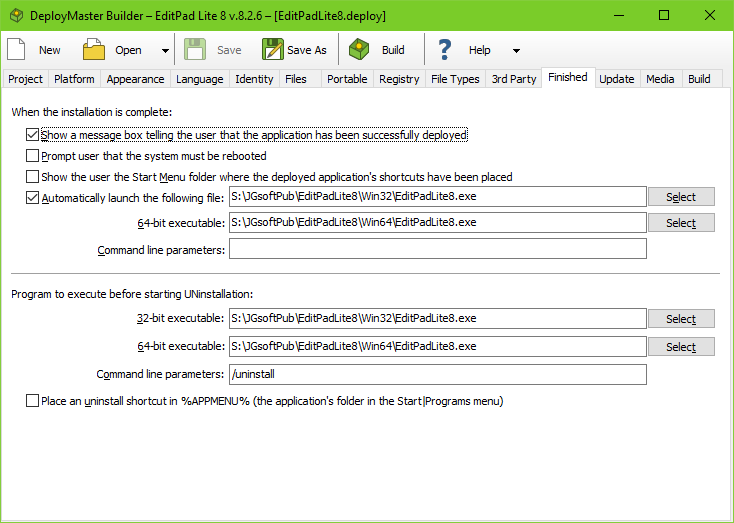 DeployMaster will figure out where the file ends up on the user's system, and adjust the path accordingly. You can also specify any parameters that should be passed to the executable on the command line. If you turn on both this option and the option to show a message box, then the file is only launched if the user clicks the Thanks button. If the user closes the installer with the X button, then the executable is not run. The file is also not launched when the installer is run silently. You should use the launch option on the Finished page only for launching your actual application after the installation is 100% complete. If you need to run executables to complete the installation, specify that on the Files page or on the 3rd party page. If the user starts your installer normally by double-clicking it in Windows Explorer (as opposed to right-clicking and selecting Run as Administrator) then your installer will launch the installed application without administrator rights even if the installer requested administrator rights for itself during the installation. This ensures that your application is run exactly the same way by the installer as it would be when the user double-clicks its desktop shortcut. Many installers incorrectly run the launched application with admin rights, which leads to problems with user-specific settings when users have separate admin and non-admin accounts. Program to execute before starting UNinstallation: If your application makes modifications to the user's system (file associations, new registry keys, etc.) after it has been installed, these modifications will not be reverted by DeployMaster's uninstallation program as there is no record of them in the Deployment Log. In that case, you should specify an executable that should be ran before UnDeploy does its work. This executable must be one that is installed by DeployMaster. Important: If you specify an application to be run before your package is uninstalled, that application must terminate with an exit code of 1 (one). Otherwise, UnDeploy will NOT continue with the uninstallation. Consult your development tool's documentation to learn how to terminate your application with an exit code other than zero. Place an uninstall shortcut in %APPMENU%: If you mark this checkbox, DeployMaster will automatically create a shortcut in the "default Start Menu folder" which you specified on the Project page. The shortcut's icon will be a recycle symbol and its caption "Remove <application>", which you can change on the Language page. When the user clicks on this shortcut, your application will be uninstalled. Creating this shortcut is convenient for people who don't know how to uninstall software via the Windows Control Panel. The user will be able to uninstall your software via the Control Panel, regardless of whether you select to create the shortcut or not. You should only select to create an uninstall shortcut if you have added other shortcuts under %APPMENU% on the Files page. Otherwise, your installer will create a new start menu folder that contains nothing but the uninstall shortcut. On Windows 8 this will cause the uninstall shortcut to appear on the Start screen, which is inappropriate. On Windows 8 and later, applications should only create a single shortcut to the main application. Applications are uninstalled by right-clicking the application's shortcut and selecting uninstall. If you are primarily targeting Windows 8 and later, you should turn off the option to create a shortcut to the uninstaller. On older versions of Windows the user will still be able to uninstall via Add/Remove Programs in the Windows Control Panel.